“This nearly 50-year-old, family-friendly tradition brings over 500,000 people to the heart of the Old Pueblo every year. The Fair hosts artists from around the world, decadent food, local entertainment and a lot of fun! The Fair is biannual, taking full advantage of our wonderful Sonoran Desert climate, with one in the Winter and the other in Spring. 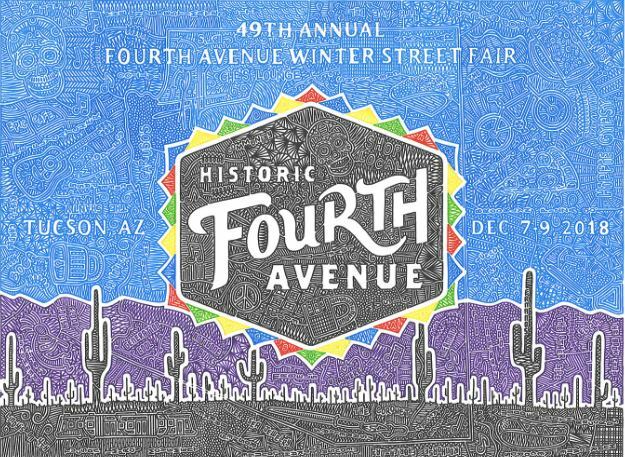 Winter street fair on 4th Avenue starts today, thru Sunday. Enjoy the winter weather in mostly sunny Tucson at this popular shopping (and eating) event. Scattered showers predicted for today, but hopefully will pass.